The Norwegian Breakaway is the first of two cruise ships with a new class of “Freestyle Cruising” on the high seas. With this concept, the American “Norwegian Cruise Line” (NCL) combines relaxed hospitality with modern comfort and a wide range of things to do on board. Over 4,000 passengers can enjoy the luxurious surroundings and attractions across 14 decks, and all without a formal dress code. The 29 different dining experiences include an ice bar with ice sculptures, where drinks are served at temperatures of 17 degrees Fahrenheit. The activities on offer include a ropes course and nine-hole mini-golf course. The on-board spa gives guests a special feel-good experience with Hansgrohe Raindance Waterfall overhead showers. In the relaxing surroundings of the suite bathrooms, Metris faucets offer lots of individual space with comfortable spout heights at the wash basin. With its innovative promenade deck “The Waterfront”, the NCL’s Breakaway class guarantees a special cruise experience. Numerous restaurants on this open deck offer outdoor seating and a sea view. The area invites guests to take a relaxing stroll – just like on a beach promenade – and combines the experience of the high seas with outstanding on-board comfort. A unique pleasurable shower experience is offered by the Hansgrohe showers, which are equipped with water-saving AirPower and EcoSmart technology. Both innovations improve the environmental qualities on the cruise ships – a factor that is becoming increasingly important. Since 2013, the Norwegian Breakaway travels regularly from New York to Bermuda, the Bahamas and the Caribbean. 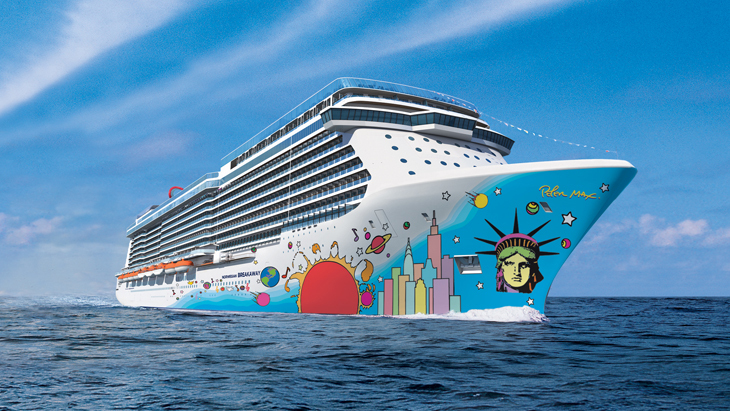 The pop art design on the hull pays tribute to its home port, while the design on the identical sister ship Norwegian Getaway evokes the colorful world of Florida. Since 2014, this ship has sailed from Miami to the Caribbean.